Step 3: Practice what you’ve learned in these videos for a week. Then go to Lesson 1.3: Curative Meditation Medicine. 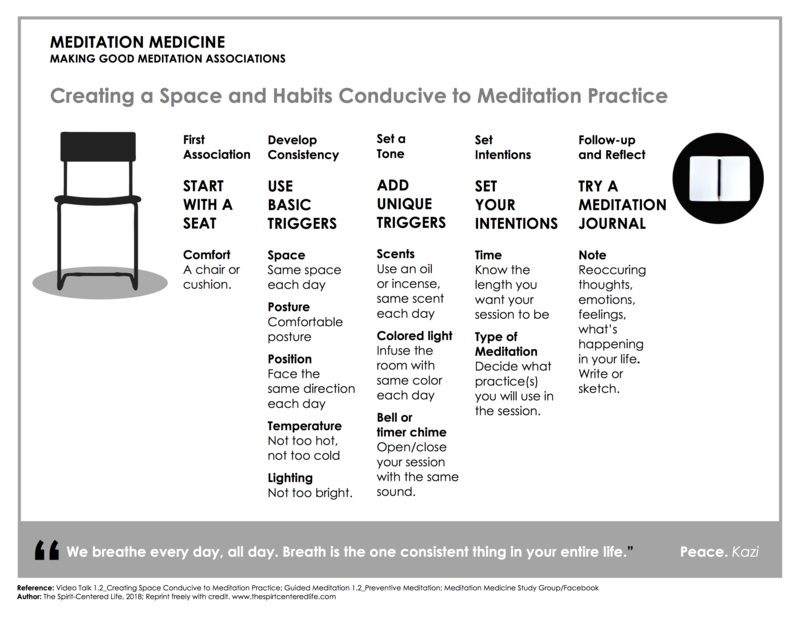 Additional Resource: Infographic 1.2: Creating Good Meditation Associations. Feel free to print this out and use it as a reference. Consultation: Optional twenty-minute consultation with Kazi concerning your meditation experiences, insights, challenges, etc. via email, phone, or skype. Contact us at info@newarkmeditation.org to request. Ongoing online group discussions and teachings with Kazi: You can join the Meditation Medicine Study Group on Facebook to engage with a group of kindred spirits to share your meditation medicine journey with. This entry was posted in Ancestral Domain, Ancestral Meditation Medicine, Body Scan Meditation, Breath Meditation, Meditation Medicine, mindfulness, Online Study Group, Spirituality, Uncategorized and tagged #breathmeditation, #meditation, #newarknj, ancestraldomain, ancestralmeditationmedicine, bodyscanmeditation, meditationmedicine, meditationmedicinestudygroup. Bookmark the permalink.